Hull City manager Peter Taylor has vowed to lead the Tigers to promotion. But the former England Under-21 coach admits it is likely to be next season at the earliest before he delivers his pledge. "I have been very fortunate to win two promotions in my managerial career and, mark my words, I will win a third with this football club," he said. "I'm still hungry for success. I still love the game and I am totally committed to this football club." Despite a significant outlay on players and the biggest crowds in the Third Division at their new ground, City remain stuck in mid-table. Under Taylor, Hull have won just six of their 18 League games since he replaced Jan Molby. But the former Leicester City, Gillingham and Brighton boss insists he will get it right. "I've only been here four months and that's not long enough," he told the Hull Daily Mail. "When I took over we were 18th. Now, even after the slump, we are 14th so we have made some progress. "I haven't given up hope of the top seven this season although obviously we need to go on a brilliant run, starting now. "At the moment, it doesn't look like it will happen, but you never know. "We have got some good players at this club but they are low on confidence and self-belief." 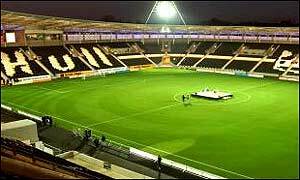 Links to more Hull City stories are at the foot of the page.